Want to take your skis along with you on your next ski trip? Sure you do, you want to be on your own skis when you are ripping the slopes in the Rocky Mountains or over in the Alps. This is the Ski Travel Case that you need. Everyone has seen how the airlines and shipping companies handle luggage and package. Do you want to subject your beloved skis to this? NO! This case was specifically designed with air travel in mind. Instead of a soft fabric bag, this is a hard case (padded in the tips and tails) made to withstand the rigors of shipping. In this ski travel case you can pack 2 pairs of skis and 2 pairs of poles along with room for some of your other gear like gloves, hats, and ski socks. These ski cases are made with pride by Sportube. Each ski bag/case is designed to protect valuable winter sports equipment from the abuses of airline check-in or shipping by UPS or fedex. The hard plastic shell offers superior protection over a soft bag and creates a shield around the equipment protecting its contents better than a nylon bag. The hard shell plastic doesn't tear and is resilient to dings and bangs. There are no buckles, zips or permanently attached straps to get ripped, torn or broken. Therefore, it will hold up better and last much longer than a soft bag. Some airlines will only take liability for skis and boards packed in a hard case, soft bags may require a signed liability release. All Sportube cases are fitted with heavy duty rubber wheels making for an easy journey from the car to check-in or car to hotel. Sportube cases are now bigger than ever, the design fits almost all ski/binding systems (check dimensions below). Pulling the sportube through the airport or parking lot is now easier than ever thanks to the addition of the Easy Pull attachment point and the Easy pull Handle. When you get to your car or rental vehicle you don't need to pay for the upgraded ski rack, instead just strap your ski case on the top with a pair of roof rack tie downs. A great feature about this hard carse is that it integrates seamlessly with Sportube's Boot Bags using their Hitchin technology. Essentially, Sportube has designed it so that the boot bag can easily "piggyback" on the bottom of their hard ski cases. Together, a hard ski case and this bag make a complete transport system for all of your ski gear. Since Sportube's hard cases can be rolled, it creates an effortless way to roll everything around in an airport or parking lot. If you don't already have a way to transport your boots and other gear, then we recommend a Sportube boot bag because everything they make is premium quality. Established in 1996, Sportube is the World's #1 supplier of hard sided travel cases for Skis and Snowboards, Fly Fishing Rods and Reels, Spearfishing equipment, Water Skis and much more. Sportube cases are molded and assembled with pride in the USA using the best quality raw materials and components. Sportube is the exclusive ski case sponsor for NAASF (North American Airline Ski Federation), Ski Cross racer, Matt Brady, the USA Telemark Ski Team, USA Men's and Ladies Spearfishing teams, USA Rafting team, as well as supporting many other aspiring racers, competitors, athletes and regional clubs. If you’re a serious skier, rider or angler and you want to keep your equipment at its best, check out the benefits of traveling with a Sportube. Be Creative - Whatever you can stuff in! Will My Skis Fit? As skis and bindings evolved, in 2006, the mold of all Sportube cases was modified to increase the size to accommodate all ski models and binding types. If you have have a question about your particular set of skis and bindings, please double check the dimensions above vs. the widest part of your ski. We found we were able to fit a twin tip, full rocker pair of skis that are 160mm at their widest point. As long as you have regular alpine bindings, you are in the clear. If you do have riser plates or demo bindings (taller due to adjustment track), your skis need to be 140mm or less at their widest point. Well I can speak from experience that airline travel is really tough on ski bags. I have gone through at least two ski bags that got ripped, torn, and busted zippers all from the airlines. I am one of those who usually takes 2 pairs of skis with me and also stuffs the bag extremely full of all kinds of ski gear so it is quite the load the bag has to support. The Sportube is just such a better way to do it. Think about it, hard plastic vs cloth - I think you know which one is going to win. I will say the packing of a Sportube is a bit more complex especially if you want to fit in all the other ski gear likes gloves, socks, ski pants, underlayers, etc. If you think it might be too tight I would recommend going one size up. 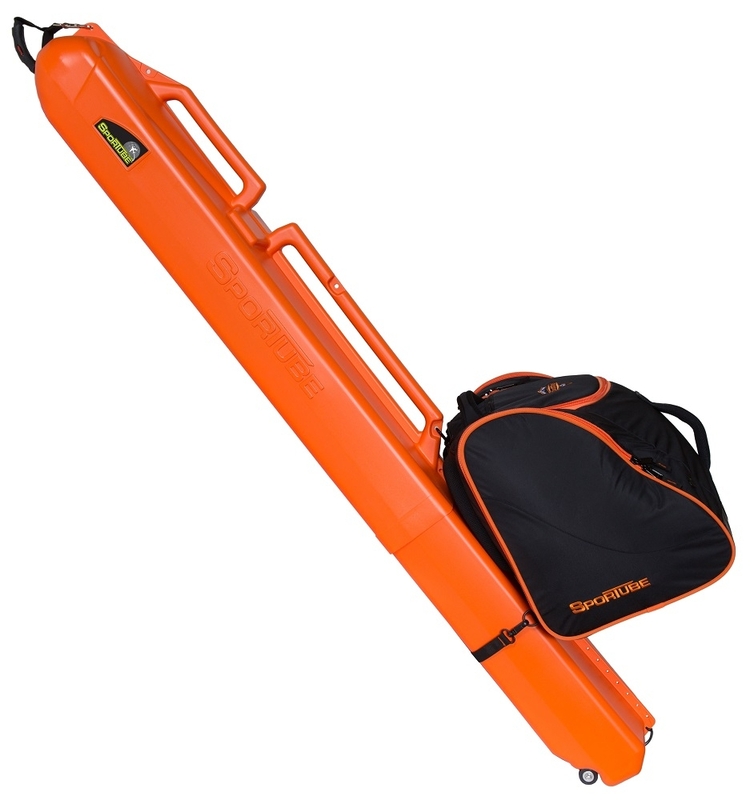 If you are taking only one pair of skis, get this double ski case. If you are taking two pairs and want extra room go for the Ski and Snowboard Travel Bag (Holds up to 3 pairs of skis or 2 snowboards). In the end I can be confident my skis are going to make it to my final destination in one piece with this Ski Travel Case. If you are like me and don't live by the mountains, you want to make the most of every ski trip, so why chance it with an inferior ski bag? Get this one! Can you strap these travel tubes to automobile roof crossbars? Yes, you can strap the ski, or the larger ski/snowboard, travel tubes to car roof racks, which comes in handy. You would want to use these straps here. As long as you strap them down tight, and wrap them through/around the handles of the travel case, it will be secure. Also, you are probably going to want to make sure you are using this lock, so the regular pin doesn't pop loose while going down the highway. Currently, I am on my second soft double ski bag to carry one pair of 168cm [66"] alpine skis/poles with Knee Bindings and a lot of clothes -- and it needs repairing despite all the padding I put round the skis and their tips/tails. It comes out to 50# and is about 11.5"x7.5"x75" - the bag itself is 8.5#. I am thinking the Sport Tube Double Ski Bag does not have enough volume, but the snowboard Tube does. Plus with the additional volume of the snowboard Tube, there should be less "cramming" to get everything inside making it easier for TSA to unpack and repack the larger Tube. I will have to pare back my stuff a few pounds to get back to 50# total. You have done a good comparison of these travel case options for your gear already. The ski/snowboard tube, seen here, is larger than the Sport Tube double ski bag. If your main concern is the space, that case would be the way to go. As you noted, the thing to be concerned about is the weight, but as long as it is just one pair of skis and clothing, you should be able to make the 50 pound cutoff, and it would work for your travel needs. Nice solid case to use when I fly with my skis. With the airlines these days I never felt good with my skis in a bag getting bashed around by the lugage handlers. This is a better solution. I also got the TSA approved lock which keeps my skis secure.